Moving back to the West Coast from the Rockies has presented a whole other world of exploration and adventure. 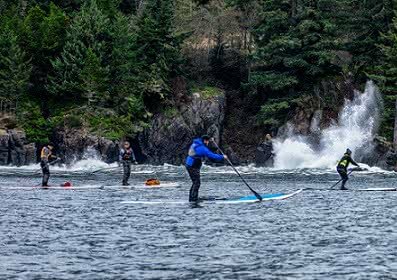 From someone aspiring to be a heli-ski guide to someone aspiring to be a SUP expeditioner, guide and instructor. My, the tables have turned! Back in the fall of 2014 I had the pleasure of meeting one of the greatest SUP expeditioners and adventurers, Norm Hann. He was hosting an evening presentation of a documentary he made of his travels around Haida Gwaii and the Great Bear Rainforest. During that, he was advocating the importance of the waters around them and the people who reside there. Above all, the incredible dangers a massive pipeline pose to this pristine vital ecology of the rainforest. Norm highlighted the importance of our coast as being the largest temporal rainforest in North America. After hearing him talk, we would set out at first light the next day to paddle the lower half of the Juan de Fuca straight. The majesty of paddling the west coast of Vancouver Island captivated me. This was my introduction to “STAND”. And the introduction to my new passion, and life goal, SUP touring/SUP exploration/SUP adventure/SUP Instruction. To me its all one, to be free to explore, to adventure, to share and to educate. 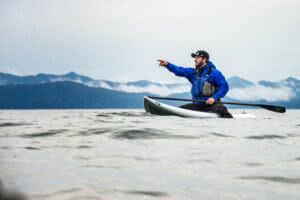 After several months of smaller, lonely solo day tours, hopping local islands and familiar shores stretching from Canoe Cove to Albert Head, a couple of good friends Mark Bitz, and Graden Bruce (from Ocean River Adventures) and I came up the idea to circumnavigate Saturna Island. And for the second time in my now short lived SUP’n career, my mind was blown once again. This was no longer just a dream or an idea. This was an honest to goodness Friday to Sunday adventure around one of the most majestic islands in the southern gulf. From rapidly changing current, to sand cliff walls that put the Game of Thrones to shame. Not one of us shut up for 48 hours, it was just too much, or not enough, as the case would be for me. 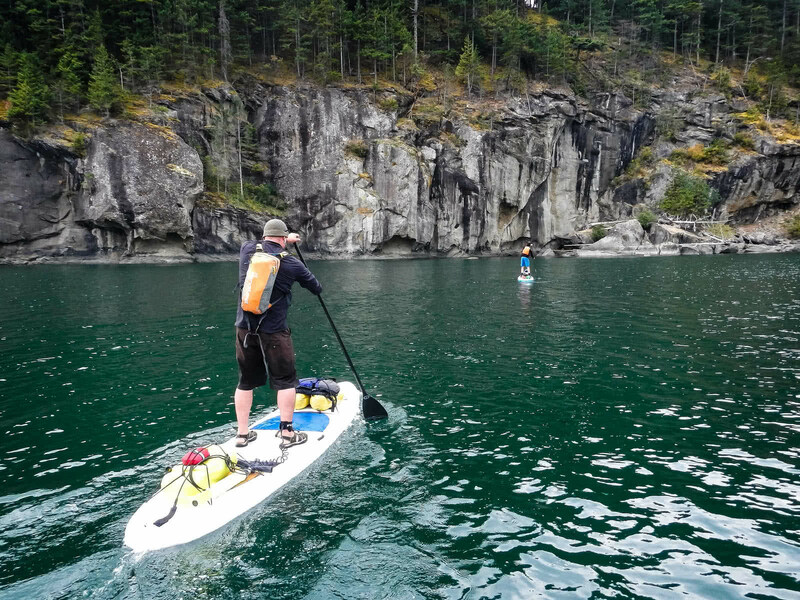 After that every long weekend, and anytime I could sling a few days together, I began my quest to paddle all the Gulf Islands. My thirst for knowledge of the seas that surround me and how to confidently navigate them grew. Charts, understanding the tides and currents, not just in a book but on the water, weather prediction and how to tie it all together became the tool I needed to continue my pursuit to explore them all. Next came Maine and Provost. Paddling into Active Pass behind the first ferry in the morning as the light breaks the Eastern sky, not too close to the shore or you’ll be sucked under. Don’t let the current pull you into the middle or you get run over. I mean actually, there is not a lot of room when two ferries are passing each other in such a narrow body of water. After navigating whirl pools in Miners Bay it’s out into the Georgia Straight and total exposure. FYI not a good time for photos. Then I went around the north end of Curelew Island down to Lizard Island and back to Village Bay. The next morning, a trip around Provost and back to Village Bay to catch a ferry home. What is next… North and South Pender? Sure. This wasn’t so much a circumnavigation of the two islands as it was more of an exploration, splitting the two, rounding the North island and into Long Harbour, Salt Spring Island. There I got to spend an evening with family, friends, and the best Frisbee golf there is to be had. By now I had spent so much time over the course of a couple years touring and exploring. I needed to spend some time actually working, and so I did, day in and day out. As several months passed, the tension built and I just new something big was going to happen, I craved more adventure. The idea of paddling from Nanaimo to Victoria was born. With the intent of touching every island along the way. But that’s another story for another time. Every paddle, every adventure has a story and every island is different and unique. I look forward to sharing them with you and how to get there! But not right now. Fast forward a year and here I am five years after I first set out with Norm as green a paddler as there ever was. 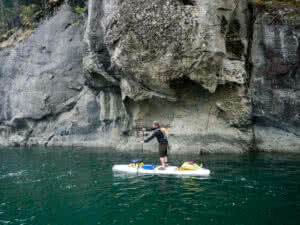 Now assisting my mentor on one of my most favourite paddle routes on Southern Vancouver Island. This is Pedder Bay East Sooke to Victoria Harbour. We will learn about the waters we paddle, the history and mystery behind the Scia’new Nations. The sea life and wildlife that stretch one of the longest beaches on southern Vancouver Island and more. 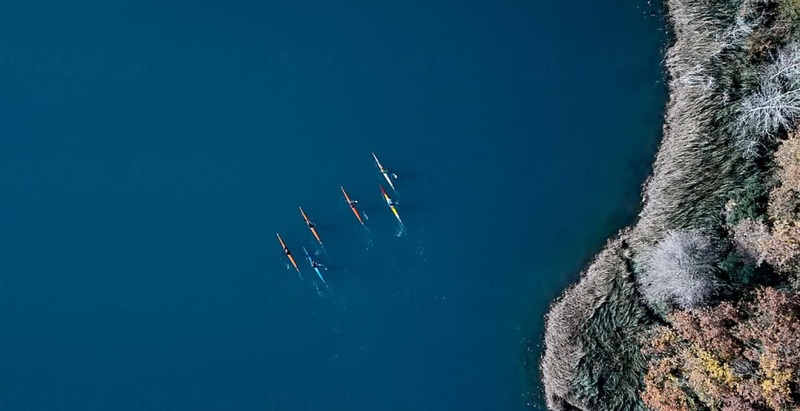 Exploring, adventuring, sharing and educating with the hopes that other paddlers will be inspired to take the next step. Every paddle, every adventure has a story I look forward to hearing yours.